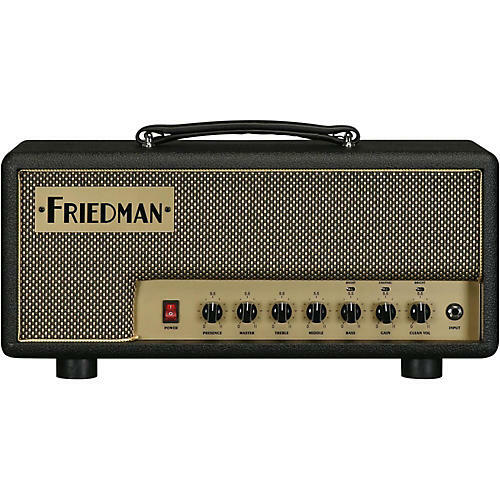 Incredible Friedman tone in a versatile 20W size. The Runt-20 is a versatile 20-watt head that delivers Friedman's legendary tone from a compact two-channel amp. The Runt-20 power section is driven by two EL84s, and the preamp features three 12AX7s. The "simple" clean channel features a volume knob and three position bright switch that delivers singing cleans to slightly broken up tone. The heart and soul of the Runt-20 is the overdrive channel which will take you from classic rock to all out assault. Use the Boost switch and Gain knob to dial in the perfect amount of overdrive. A global presence Control shapes the high frequency response of the Runt-20. The Runt-20 delivers the tight bottom end and midrange that is typically only found in much higher wattage amps. Dave achieved this utilizing custom transformers and the cleanest signal path possible. The Runt-20 is ideal for many styles of music from blues to classic rock and heavy metal by merely adjusting the gain and master controls. Plugging into the Runt-20, you will instantly notice the harmonically rich detailed chords and resonating single note lines. This amp cleans up exceptionally well with the guitar’s volume knob, even with the amp on higher gain settings. This is the first amp Dave Friedman has ever made with has an internal load and XLR cab simulated output. Comparing this analog circuit to some of the most intricate computer based IRs, Dave achieved a record output you can proudly send to front of house or use in the studio. The Runt-20 also allows you to play "silently," meaning you can plug and play the amp without having a speaker cabinet connected. The XLR output includes a ground lift, level and center / edge of speaker cone simulation switches. This Runt was designed to take pedals well and loves boosts, ODs, phasers, flangers, tremolos and wahs. The ultra transparent, buffered, series effects loop takes time-based effects pedals and rack units equally well. The head cabinet features beautiful black tolex, Baltic Birch construction and is built to withstand the rigors of the road. Dimensions: 18 in. x 8.25 in. x 8.75 in.